More than two dozen homeless residents of the Albany Bulb along the East Bay shoreline will each receive $3,000 from the city — that is, if they leave the site and remove all of their personal property by Friday. These are the key terms of a settlement agreement announced today, effectively marking the end of the high-profile eviction battle between City of Albany officials and a group of housing advocates representing the Bulb's homeless residents. The news today comes months after the city began pushing forward with its plans to move residents out of Albany Bulb, which has grown into a well-known homeless camp and artist community over the years. A group of residents in response sued the city and requested a temporary restraining order in hopes of at least postponing the winter eviction until there was a plan in place to provide them access to housing. 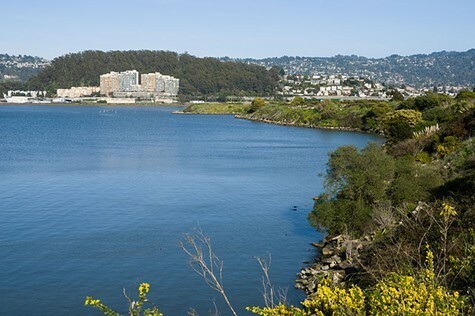 The city's long-term plan is to turn the Bulb over to the East Bay Regional Park District and California State Parks to incorporate it into the Eastshore State Park. The city had offered last year to set up a temporary shelter for Bulb residents in portable trailers parked near the entrance road to the Bulb, but the lawsuit alleged that this setup was insufficient for a number of reasons. The firm Kilpatrick Townsend and Stockton filed suit along with the East Bay Community Law Center and the Homeless Action Center; they alleged that the proposed temporary shelter would not have enough beds for everyone being evicted, would be inaccessible to residents with disabilities, and would not provide the privacy they were afforded in the Bulb. The suit said that the city had not responded to a letter asking that officials delay the eviction. These advocates also argued that Albany's evictions amounted to a violation of the Constitution, because they were essentially making it illegal to be homeless in the city. The 28 residents will be entitled to a $3,000 cash payment in exchange for their agreement to vacate the Bulb and remove all their personal property no later than April 25, 2014. In lieu of removing their personal property at their own expense, they may designate personal property to be removed and stored by the City for up to 120 days. Plaintiffs who do not accept the settlement will be entitled to dismiss their claims without prejudice. The City of Albany is encouraged by the progress made to find a mutually agreeable settlement. The settlement agreement allows the City to continue assisting people, connecting them with human services and housing through the City's service provider Berkeley Food and Housing Project. To date we have successfully housed 13 people and 1 infant, and are continuing this progress to help people transition from the Bulb. The settlement agreement states that the funds are "intended, though not required, to be utilized for temporary housing and relocation assistance — e.g., moving or replacing personal property, paying for temporary occupancy in a motel or single-room occupancy hotel, paying a portion of rental expenses for longer-term housing, furnishing an apartment, etc." The residents, the settlement notes, are also eligible for support services of the Berkeley Food and Housing Project, but if they choose to receive these monetary payments, they will not be eligible for additional rental housing subsidies from the city. The agreement further states that participating Bulb residents agree to "stay away from Albany Bulb and Neck, the City-owned property on Pierce street, and Albany Hill areas in the City of Albany for a period of 12 months." You can read the full settlement document here. “For a number of Albany residents experiencing homelessness, the Bulb has been a place they call home for 15 or more years," Maureen Sheehy, a partner with Kilpatrick Townsend, said in a statement. "To simply evict them without providing any compensation to assist with additional housing arrangements was not acceptable. This agreement gives these residents recognition that they have a voice and are not simply anonymous individuals."